What a nasty piece of work. He should have been ejected from the bus at a minimum. Did anyone around you say anything? Hope your foot feels better. Well, he certainly looks like a winner. 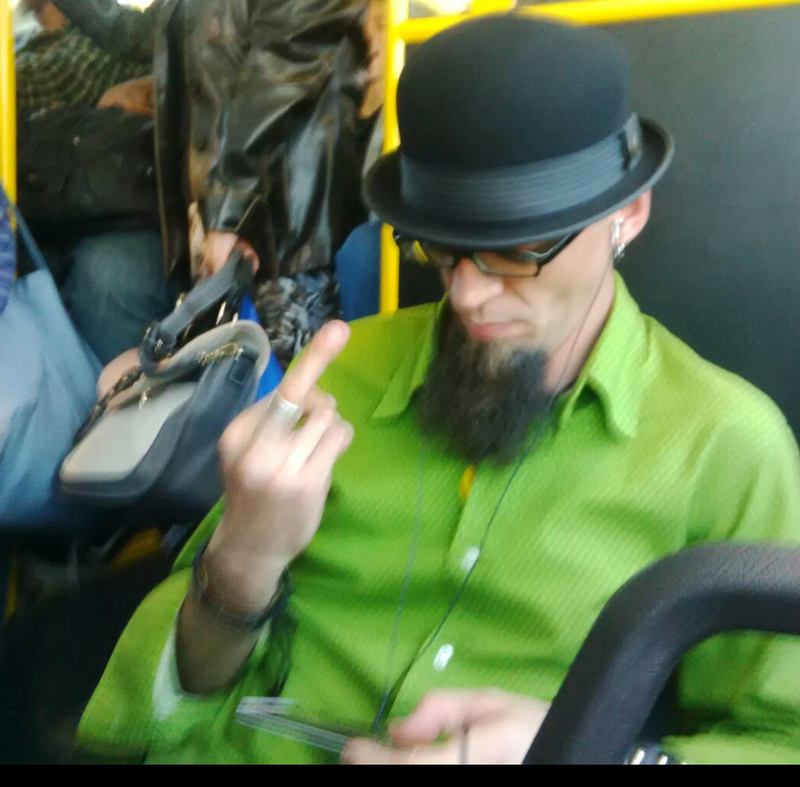 Bowler hat, putrid green button-up shirt, pubic looking beard and jewelery. Yup, keeping it classy in East York! ^ Not my story. Not my foot but this is circulating on Facebook publicly. So if you look up Brenda Davie, you can express sentiments to her. You'd hope she reported it. I hate to say it, but this dude should have had someone punch him right in the smug face so those horrid glasses wind up in his eyeballs. Then the bowler hat should get turned into a soup bowl by stomping on it. If I was 20 years younger and was present, that would have been worth any police trouble. Why would this not be reported as assault? Last time I checked, stomping and pushing people - anywhere - is classified as assault and with apparently a packed bus full of witnesses, surely this could and should have been dealt with like any other crime. Disgusting piece of work, this guy. Hey people - back off! I'm not going to lie...if he stomped on my foot like that he'd be missing a few teeth right now. Brenda posted an update on FB saying she's thankful for all the support and that the TTC people (Brad Ross) has been in touch with her asking for more information. It's one thing to tell someone to natter off, but when they're stomped on and pushed out of the way, a line has been crossed and it's assault. Crap like this just pisses me off. If I had any encounter with someone like that dude, I would challenge them to a fight and let Darwin take care of the rest. The problem with challenging a douche to a fight is that YOU would be the one charged with assault. Without a doubt, as soon as douchebag loses (and really he lost as soon as he got dressed that morning), he would be complaining to the cops. I shared this on FB and it was removed. Anyone know why it was pulled??? Could people please stop lumping everyone from East York in with this loser and painting everyone with the same brush? He's a jerk. Not everyone in the east end is. Thanks. It may be gone from FB but this is the internet. Things live on forever. Ohhhh and it's the worst kind of hipster...the aging hipster. Good guy TTC?? Apparently they're investigating. Before we string this 'douchebag' up for his evil deeds, it would be nice to have a third party confirmation of the facts or even just to hear his side of the story. Before the accuser changed her privacy settings, people discovered a picture of her with a dude who looks strikingly similar to this very unique looking individual. Something smells here. Could it be that this was really a spat between a former couple, and one party just used social media to shame the other? not so....this was on CITY news last night and there was a witness to the incident. 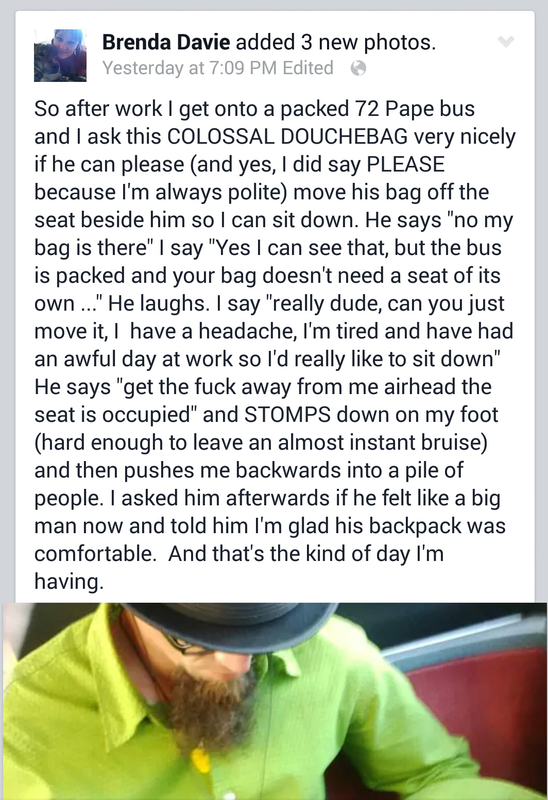 Whether it was a spat or not, an assault took place and the bag should have been removed from the seat for "anyone" to sit in regardless of who was asking. Nothing smells!! Let's not lose sight of what really happened here. I don't think that it's the same guy. There are similarities sure, but the guy in the green shirt appears to have a lighter complexion and more angular features as well as looking older. There's a video now on YouTube. Unfortunately doesn't support any physical claims.. However maybe that part of the clip is in the right hands. Douche bag for sure! It's the same guy, but is that Brenda Davie in the photo? She doesn't look totally like the woman in the video. That lady has balls. Not you.